I have settled on a case-study approach to my PhD research. It will focus on five local governments in the greater Illawarra region of New South Wales, considering how they form and react to public issues via participatory media. The five local governments, Wingecarribee Shire, Wollondilly Shire and Wollongong City, Shellharbour City, and Kiama Municipality, have been chosen because they occupy contiguous territory, share key geographic resources and populations and have active issue-publics. Wollongong City acts as a regional capital for this area, which might collectively be termed ‘the greater Illawarra’. A key reason for selecting the Illawarra in general and Wollongong specifically as the focus case study for this research is the promotion of the information technology industry as a bedrock of Wollongong’s “transition” from an “industrial and manufacturing centre” to a “silicon beach”1. This claim, promoted by Lord Mayor Gordon Bradbery and others, attempts to position information and communication technology at the heart of Wollongong City’s brand. As such, how the council itself uses these information and communications technologies is worth detailed consideration. This map shows the five LGAs in my case study. 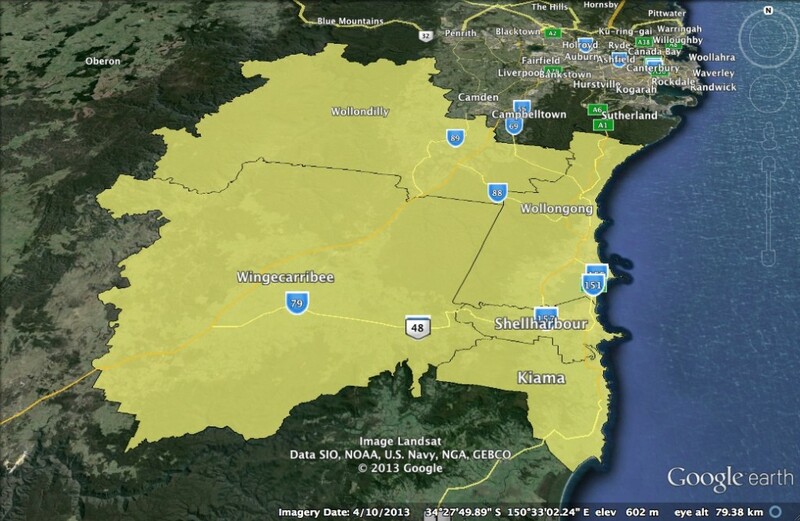 Throughout the research, I will collectively identify the region by the term ‘the greater Illawarra’. Though this is a loose application of the term, a review of relevant documents such as State Government planning tools, South East Regional Organisation of Councils (SEROC) membership and more demonstrate that ‘the Illawarra’ itself is a fluid term with a meaning that changes significantly in different contexts. It is not within the scope of my research – nor is it necessary – to define the region beyond identifying the five local named local government areas, which themselves are delimited by NSW Government gazette. In addition to the socio-economic, demographic and geographic reasons discussed above, this limitation is required in order to keep the number of case studies manageable and to allow thorough consideration of members of the public. It would be impractical in research of this scale to attempt consideration of more local government areas and still expect to include members of the public and specified publics in the research. Non-inclusion of these groups would deny consideration one side of the democratic equation, thus leaving the question unsatisfactorily addressed. The selected local governments share key physical infrastructure such as the Hume Freeway and Princes Highway, plus water catchments and mining leases and four railway lines (though only three are in active use). In addition to being physically close together and sharing certain features, they are each distinctive and offer their own advantages. Wollongong City is a largely urban area (except for protected land) with major educational facilities and waterways. Shellharbour City is rapidly growing and undergoing immense physical change due to new housing and industrial development. Kiama Municipality might be rightly called an interface or fringe local government area given its demographic profile of a major town (Kiama) surrounded by rural land and smaller villages (such as Jamberoo). It too is facing strong urban growth. Wingecarribee and Wollondilly Shires appear superficially similar. They both occupy higher ground made up of significant waterways and water catchments and protected land (largely National and State Parks). Both are characterised by a development pattern of medium-sized towns surrounded by smaller villages. Both have large tracts of open rural land. But Wollondilly is a key NSW growth area and is a fringe metropolitan local government. It sits between and separates regional and metropolitan parts of the state. Indeed the shire’s slogan ‘Rural Living’ seems to contrast sharply with the expected growth in population in coming decades. Due to all of these factors, the ways in which participatory media are employed by these local governments and their publics will provide constructive material for this research. In particular, their similarities will allow key common patterns to be identified while their differences will provide useful contrast material.